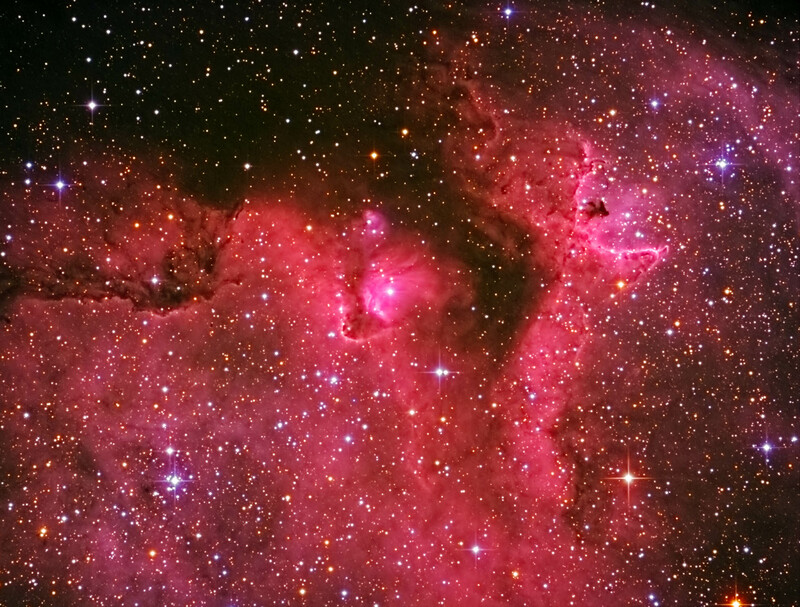 IC 1871 (also designated as Sh2-199, LBN 667, Westhout 5) is an emission nebula in the constellation of Cassiopeia. It lies 6,500 light years away and is part of the larger Soul Nebula (IC 1848), a huge star-forming region consisting of ionized hydrogen gas and accompanying dark nebula. The dark nebula is shaped by the solar winds of the numerous young (only one million years old), bright stars within. Images were focused using the camera's live view and a Bahtinov mask. Color images were converted in Camera Raw and were aligned and combined in ImagesPlus. H-alpha images were acquired, aligned, and combined in CCDSoft. An H-a/Luminance image was created using the Red channel from the RGB image. The color and Ha-L composites were aligned in Registar and combined in Photoshop. The final image was adjusted in Photoshop. Topaz Detail and DeNoise were applied.